Go to System › Preferences and provide a comma-separated list of ISO 639-1 language codes in the "Multilingual"-section of your preferences screen. The first language in your list is considered the default language. The $languages and $language parameters will be added to your XML output. The very special approach of this extension (reduce reliance on too many third party extensions, leave as much to core functionality as possible) doesn't require special multilingual field types. Use whatever (non-multilingual) field type you like by adding a dedicated field for each of your supported languages. You just need to make sure that each translation of field shares the same field handle, followed by a dash and the language code as specified in your settings. In most cases, it's recommended to mark at least all fields for the default language as required. Translations for a field can always be optional. To provide your clients with a clean and simple user interface, you should use an additional UI extensions like Parenthesis Tabs. You only have to add the fields by which you want to filter your data sources in the default language. The extension takes care of filtering your entries in the current language and falls back to the default language for a specific filter, if no translation is provided. 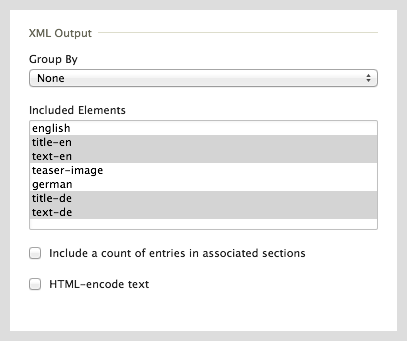 Make sure to select all languages for a field in the data source editor's "XML Output"-section. The extension removes the language segment from the field name and provides lang- and translated-attributes instead. In your XSLT, you can now use the $language-parameter to get the translation for the current language. If a translation isn't provided for a specific language, the extension provides a fallback to the default language in your XML output. 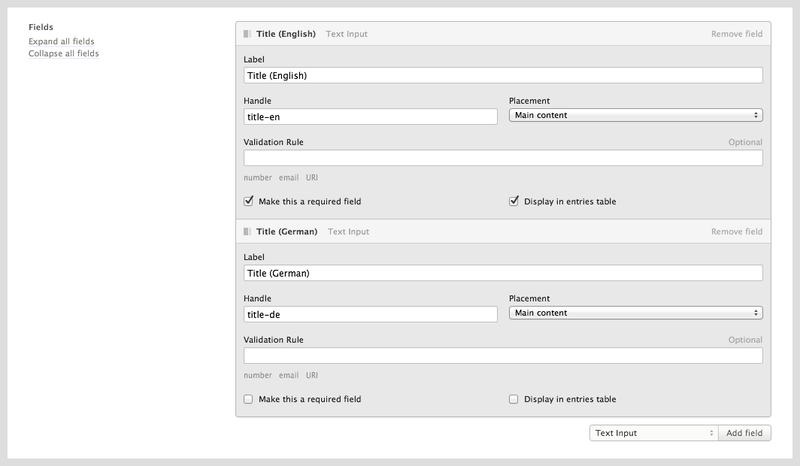 You can check if a field has actually been translated or uses fallback content by testing the translated-attribute. - Added support for "Association Output"